This week I played with my Makey Makey kit a lot. I created many projects that were listed on the Makey Makey website, yet I had trouble coming up with a project of my own that I could use in the classroom. I could not get to a thrift store or garage sale this week, so my basement was the next best thing. 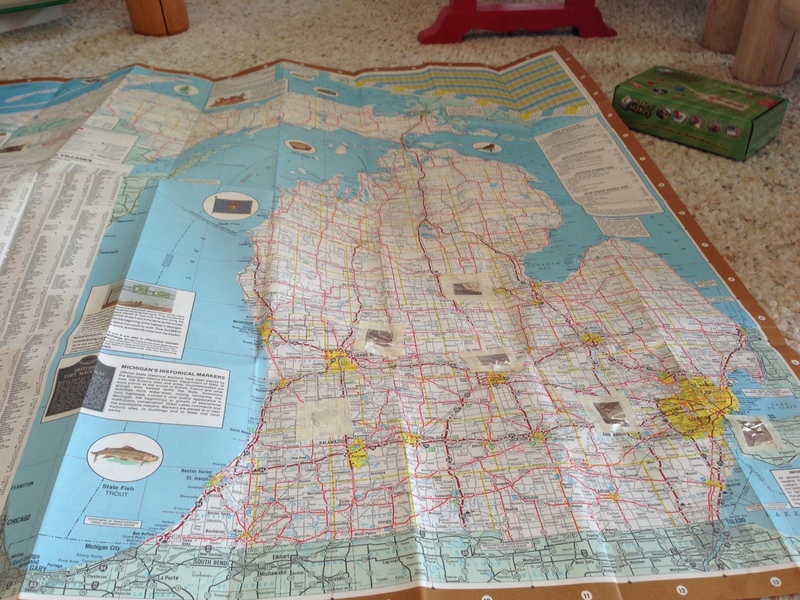 While digging through things, I came across a map of Michigan. This year, first graders had a unit on identifying features and locating places on maps. I decided to create a project using this map with my Makey Makey. At first I had trouble thinking about how to create a program on my computer to accompany my Makey Makey project. It wasn’t until I stumbled upon this helpful YouTube video that I discovered Scratch. With Scratch, I was able to design a custom program that catered to the needs of my project. I was able to utilize specific keys to control my Makey Makey. To begin my project, I created a program using Scratch. At first, this seemed to be a complicated program, however after playing with it, I discovered it was very intuitive. First, I created a simple background using the paint tools. Next, I create a series of six question about my map. I then inserted a Sprite (the car) into my Scratch program. Then, I created the script for the Sprite (Figure 1). This script told where and when the Sprite (car) would move. I assigned each move a keyboard letter (ie. to answer the first question, the letter “w” must be pressed). Each keyboard letter that corresponds with an answer to a question was hooked up to my Makey Makey (Figure 2). 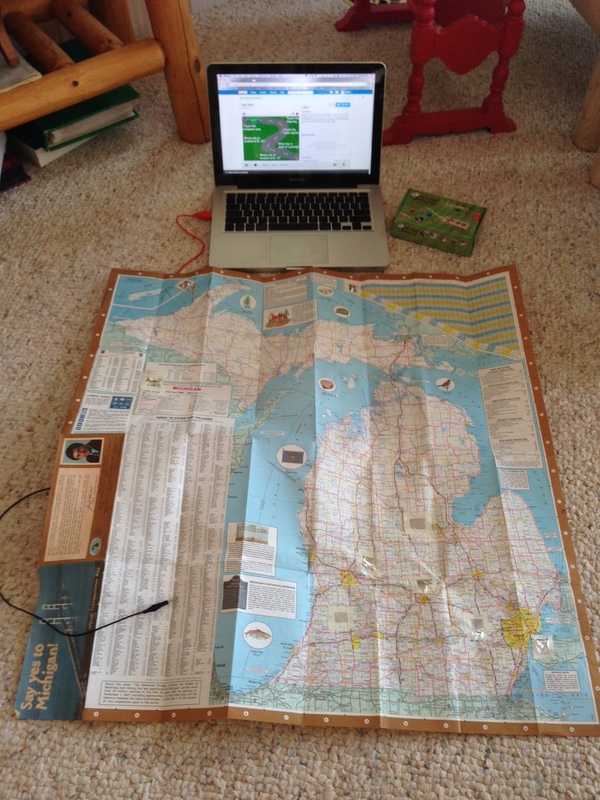 Once my Scratch program was complete, I was ready to create my interactive map using the Makey Makey. My completed Scratch program can be found here. Next, I created an interactive map to go with my Scratch program. I wanted the wires to be hidden so first, I cut holes in the map at each location that corresponded with my Scratch program questions. This way the wires are all located beneath the map (Figure 4). Then, I placed just the end of the alligator clip through the hole in the map and taped it in place. To create a “button” to push on the map, I used a conductive piece of aluminum foil and taped it over the alligator clip to the map (Figure 3). Each “button” on my map corresponds to a question on my Scratch program. I created more buttons than there were alligator clips so there were more options to choose from for the students using this. When the correct “button” is pressed, the car in my Scratch program will move forward to the next question. If the car does not move or moves to the wrong question, you will know you answered the question incorrectly. 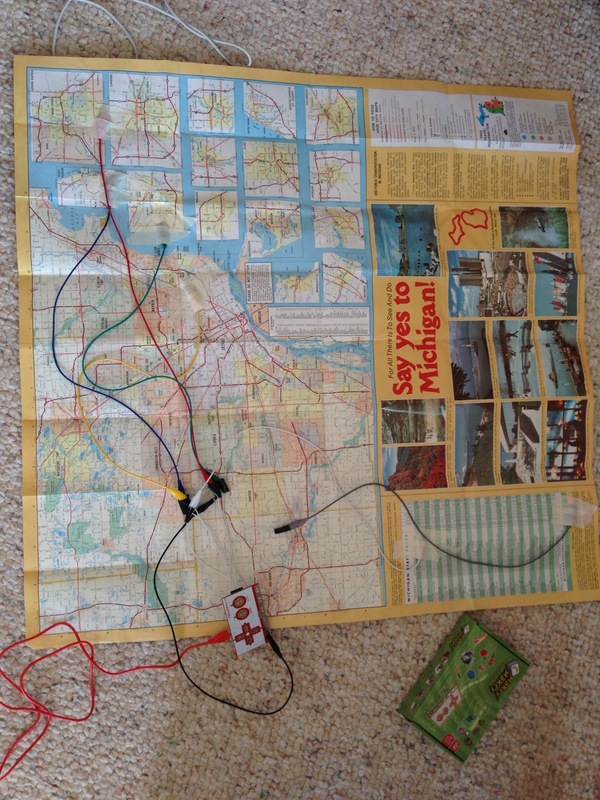 Once my Scratch program was complete, and my map was hooked up to my Makey Makey kit. I plugged the USB from the Makey Makey kit into my computer, and my activity was ready to go (Figure 5)! This lesson would be useful in the classroom when teaching students the important features of a map and how to find absolute and relative location on a map. 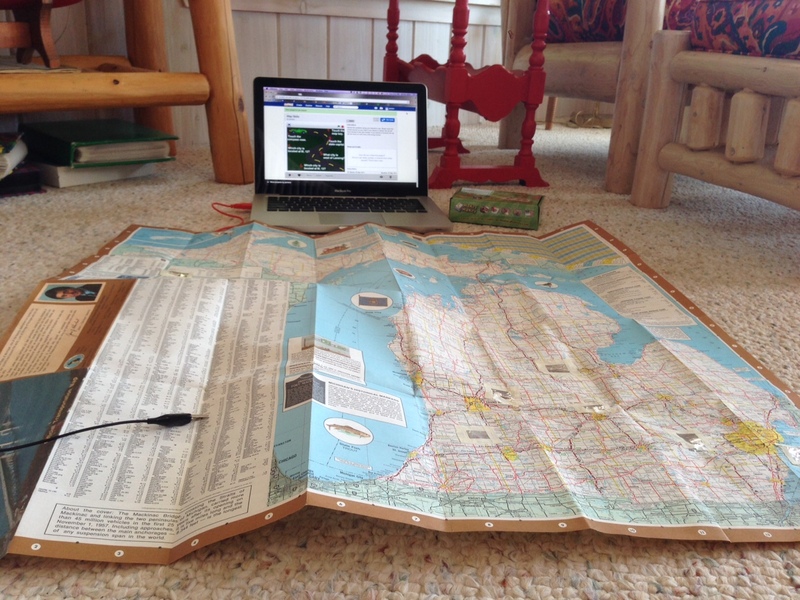 This lesson allows students to apply their map knowledge using a real map. If you’re interested in using this activity in your classroom, my lesson plan is available here. 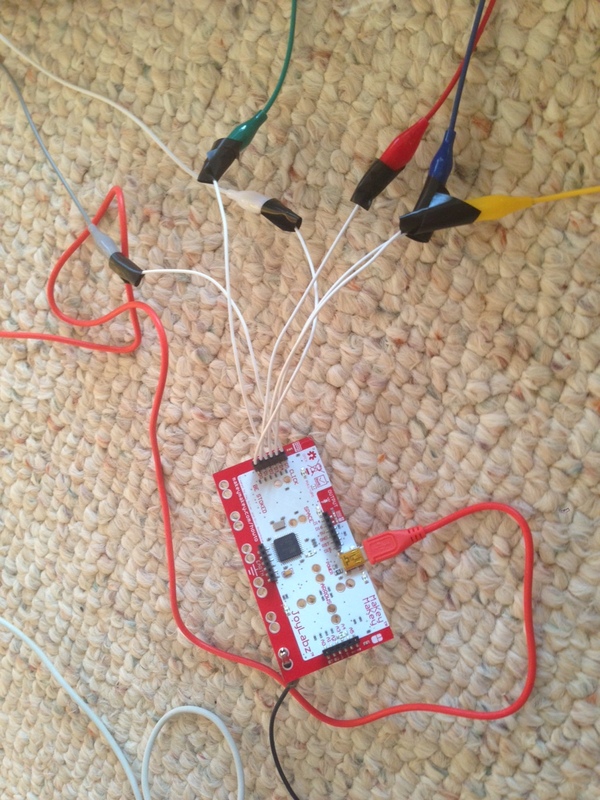 Here’s a video of my Makey Makey interactive map in action! Note: I used a mix of text, photos, and video to create this how-to post. When I was learning how to use my Makey Makey, I relied heavily on photos and videos. When creating my project, I wanted to make it as helpful as possible. I used text to explain how to set up and use my project, I used photos to show in detail exactly how I created and set up my Scratch program and Makey Makey interactive map. Finally, I included a video showcasing the final project and how it works so users can easily recreate it.